Many co-op players will spend much of the game is ghost form, like Ketchup and Mustard here. After several attempts, we eventually conquered the Mines. Snakes, spiders, arrow-shooting statues, and other nasty creatures had sought to deplete our precious few hit points. Each level had one, solitary Damsel who could replace one HP for the player who rescued her. We would need to plan and share the spoils. Some hazards, like spikes, could kill us instantly. As we learned how to anticipate traps and pitfalls we discovered we could use death to our advantage. When one of us died we could still interact with enemies as a ghost. While in ghost form we could pass through platforms and blow enemies out of position. Yes, you blow a puff of air to displace baddies. And yes, we thought this was absolutely hilarious. We merrily ordered each other to blow many a foe that night. Good times at the Gaskill household, I tell you. Ghosts aren't confined to their ethereal form. We could revive each other if we found a coffin in the next level. The surviving player would simply whack the coffin with their whip, and the co-op buddy would be back in the game with full life. This gives co-op players a huge advantage over single players. As long as one player survives to the end of the level, the game goes on. The revived player wouldn't have any bombs, ropes, or items, so it's essential to pick up your partner's gear if they die. I also noticed that if you happen to be playing with three or more players, only one character will be revived per coffin. Try not to die so much. Coffins also hold unlockable characters. Whip those suckers! 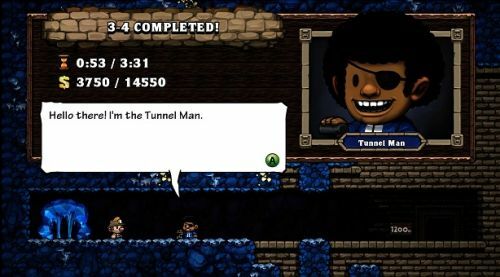 The more we played Spelunky, the more we liked it. The randomly generated levels assured us a new experience each time. There are four main areas, and each one is made up of four levels. The larger areas each have their own look, music, enemies, and traps. There are also several secret areas that require insane luck or internet detective work to unlock. The levels themselves are incredibly short, which is a good thing. This evening I finished one in seven seconds, for example. Okay, a lot of luck, falling, and bouncing was involved. There's even an achievement for completing the game in under eight minutes without using any short cuts. Good luck with that. Oh yes, there are short cuts. At the end of each area, in the single player game, the Tunnel Man appears. He'll ask you for a few items, and you'll be hating life if you don't have them. He requires several items to unlock each shortcut, so you'll need to complete each area multiple times. Since progress isn't saved in co-op play, he never appears in co-op games. That's right. After my wife and I completed an area like the Mines or the Jungle, I would have to tackle it again on my own (several times over) to unlock the short cut. Not cool, Spelunky, not cool. The best thing about the short cuts is that after I opened them up in single player we could use them cooperatively. That helped. A lot. Give this guy whatever he asks for. Trust me. I write about stuff on the internet. The lack of save game data for co-op play isn't the only flaw. Spelunky is available free on PC, but through the XBLA it costs 1200 MSP. That's $15 bucks, which is a lot of coin for a game that only offers local co-op. As difficult as it is, most players will be able to master each area in a few hours. The game gets a chunk of it's replay value through speed runs and high score leaderboards, but they are only available in the single player mode. Without co-op leaderboards, players have little incentive to do more than simply race to the end of each stage. That can get old fast, no matter how random they are. 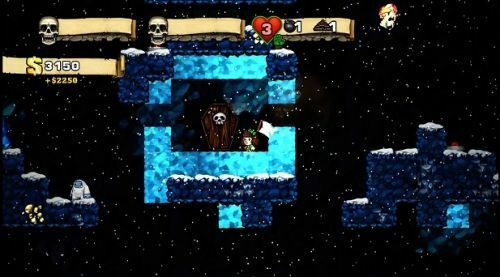 Part of the risk/reward system of the single player version of Spelunky is letting players allocate their time between exploration, gathering as much treasure as they can, and escaping before the game motivates them to vacate the level. And believe me, it will let you know when you've overstayed your welcome. Overall, Spelunky is a charming, fun, and addictive platformer with tons of replay value. The bot-supported deathmatch mode is barely worth mentioning. Matches are quick and painful. Some of its greatness is lost in the co-op mode. Cooperative play makes the game a chaotic mess, which isn't necessarily a bad thing, but it does not feel as polished and as well thought-out as the single player experience. Being forced to go back and play the levels in single player diminished any sense of accomplishment we had. A better solution would have been to have higher object requirements for the Tunnel Man. Oh well. Maybe we can look forward to that in a sequel. Spelunky is one of the first XBLA titles to be worth a total of 400 Achievement points, which I know will appeal to some. The chievos ping for all the co-op players as long as they're signed in. Yay! Noob and no-lifer designators for everyone! The price point is a little prohibitive, but it's summer time. What else are you going to do? Our Co-Op review of Spelunky was based on the XBLA version, the only version to offer co-op. A review code was provided by the publisher. 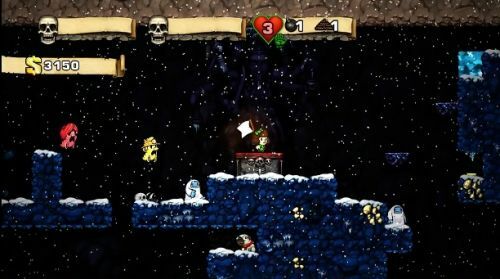 The Co-Op Experience: Four players can explore the world of Spelunky together in local co-op play.